JUST WANT TO REMIND YOU, YOU CAN BUY THE ANTHOLOGY USING THE LINKS AT THE BOTTOM OF THIS POST. OUR 30-YEAR-OLD MEMBER MISSED THE PHOTO OP. SHE IS VERA SINES-KLANK. Wow! In my little writer’s hideaway, I got a phone call to tell me the newspaper interview was published March 3. 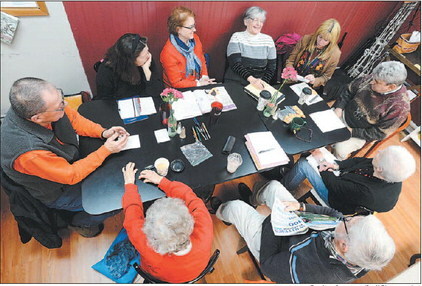 Not only was it printed in the local newspaper, but it is available on-line, too. The link is above. I don’t know how long they keep on-line articles floating in web-space, so look now. 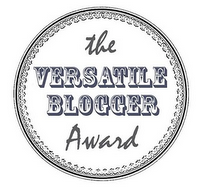 We received 5 pages of publicity in the on-line article. How lovely! In case you are hearing about this for the first time, let me give you background. 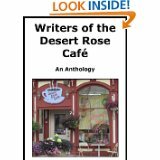 I am a member of Writers of the Desert Rose Cafe. We published an anthology in late December 2012. The book is available on Amazon.com and Barnes and Noble (on-line only) at a very affordable price. If you have an interest in a sneak preview, click the Amazon link below. The Barnes and Noble link is also available for you with Nook readers. Too many people just push their work. True marketing is about YOU more than what you do. When people like a person, they begin to like their work. By the ocean of BUY MY BOOK spam out there in the Twitterverse, I wonder if others even see Twitter like I do.